For the CIAO 4.5 / CalDB 4.5.9 release notes see How CalDB 4.5.9 Affects Your Analysis. The periodic ACIS T_GAIN correction upgrade for August-October 2013 (Epoch 55) has been released. The corrections are at nominal/expected levels of less than 2% of the energy value. This upgrade as usual affects observation data taken over the two most recent T_GAIN Epochs (55 and 54), and so would update PHAs for OBS_IDs taken since 01 May 2013. Users with such datasets are encouraged to revalidate their analysis results after reprocessing their data with the upgraded CalDB files. For specific details of the new calibrations in this release, see the technical details section below. The ACIS Optical Blocking Filter (OBF) contaminant calibration file requires an update due to recent changes the depth and composition of the contaminant with time. New modeling results from cosmic sources galaxy cluster Abell 1795 and blazar MKN421, in conjunction with fits of SNR EO1O2-72 calibration observations have resulted in a new ACIS contamination model. Regarding composition, it appears that the concentration of the several component elements in the contamination layer are also changing, which requires time-varying adjustment of the optical depths for carbon (C-K) and fluorine (F-K) with respect to oxygen (O-K), and a modified spatial model for ACIS-S in particular. A purely elemental model with the appropriate time- and spatially-dependent adjustments has recently been derived, and is being released here. Caveat to users: Beware when using high ChipY locations on ACIS-S3 for imaging spectroscopy with the CONTAM N0008 model! We are somewhat uncertain of the contaminant layer depth at high chipy for ACIS-S, and fitting results may be compromised at this location. For technical details, see Section II.B. below. See the ACIS contamination why page for more information general information on the ACIS time-varying QE/OBF contaminant. The annual update to the HRC-I time-dependent gain and the corresponding PI Background Spectrum are now available. Technical DETAILS of the new GMAP image are available below. See the HRC-I Gain Maps why page for more information. The ACIS time-dependent gain corrections (T_GAIN) have recently been updated for current changes from the previous T_GAIN epoch, specifically Epoch 55, which was August-October 2013. With the addition of these new corrections, derived from ACIS External Cal Source (ECS) data taken during radiation zone passes, the CalDB files extending from May-August 2013 (i.e. Epoch 54) have been finalized, and new non-interpolating T_GAIN files are now implemented for Epoch 55. 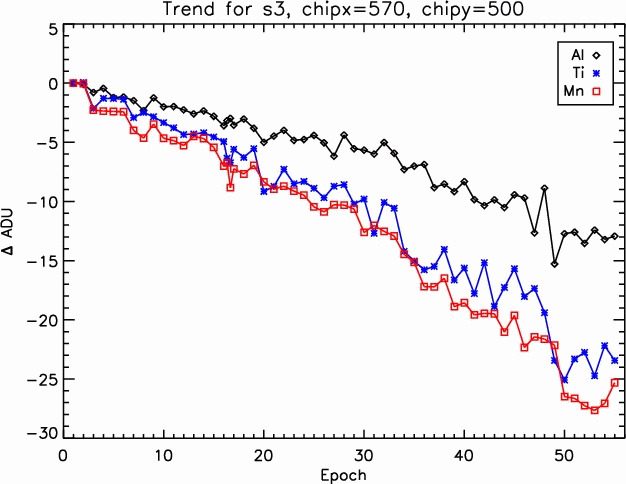 Long term trends for chips I3 and S3 are plotted below in Figure 4a and b, through Epoch 55, the latest release. The chip locations for these plots are given in the respective labels above the plots. Note that the locations are not the aimpoint positions, as with Figs. 1-3 above, but are near the centers of each chip. The deposition rate and composition of the contaminating layer on the ACIS Optical Blocking Filter (OBF) continues to change and require adjustments to the model used to estimate its absorption effects. With this new N0008 release, for the first time there is a systematic, purely elemental model (no edgeless "fluffium" component) for the ACIS contamination. This has been made possible by varying not only the depth, but the chemical composition of the contaminant with time and location. Figure 5 below gives the estimated optical depth (tau) of the contaminant versus mission date. Note the change in the deposition rates throughout the mission, and in particular the abruptly upward, almost linear, increase in the contamination rate beginning in mid 2009. Fig. 6 gives the change in tau between the center and the edge of the detector, which shows that the increasing spatial variation of the contaminant with time. Fig. 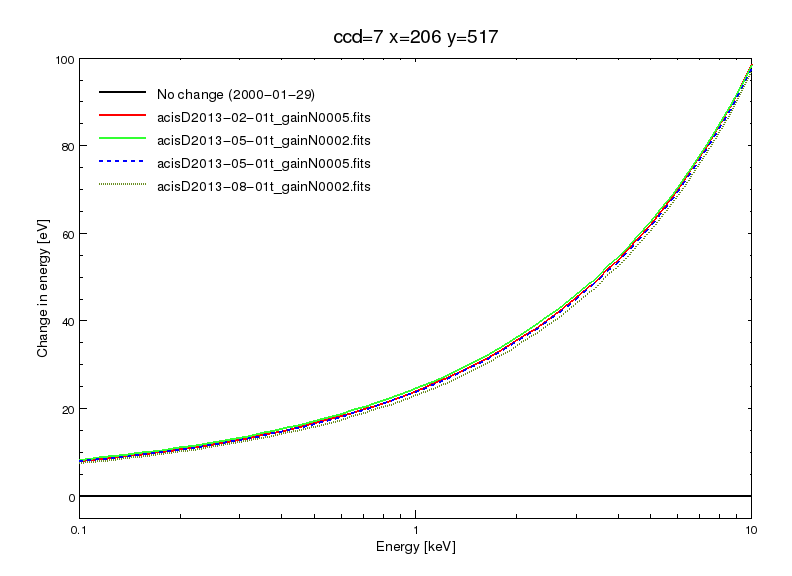 5: The optical depth "tau" of the contaminating layer on the ACIS OBF as modeled versus year of the mission time line. Note that the trend since y2009 has been essentially a linear increase with time. Fig. 6: This figure shows that difference in the optical depth at 700 eV between the edge and center of the detector. Fig. 7 below shows the accumulation rates for carbon and oxygen. In particular for the period 2003-2005, the composition of the contaminant appears to have been changing with time. variation in the composition of the contaminating layer. While the most recent (2013) data taken to monitor the contaminating layer indicate the layer depth is almost linearly increasing with time since 2009, the previous model (N0007) anticipates a leveling-off of the contamination layer going forward. Hence a new model is needed properly to account for the current trend. 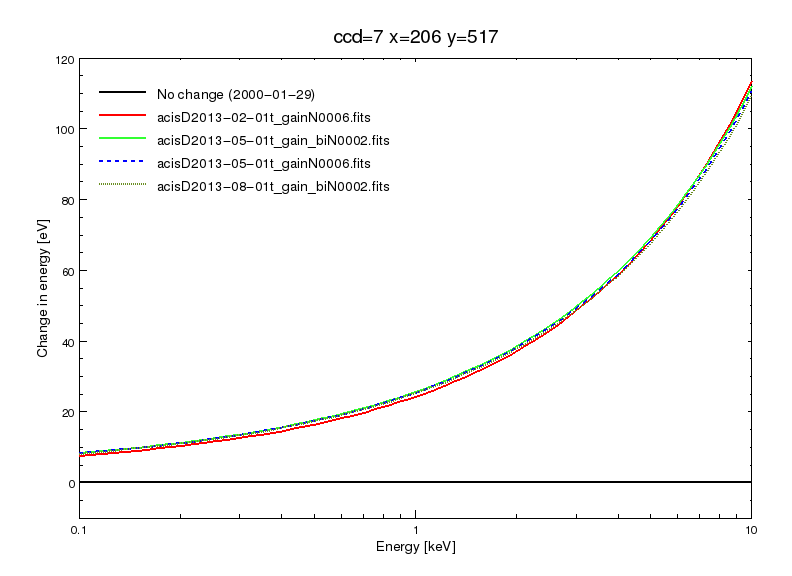 Upgrading the model for the full mission means that the new CONTAM model is not identically backward compatible with the previous version (N0007, released in CalDB 4.4.10, May 2012). However, the new model fits the tau for all periods illustrated in Figs 5 and 6 above, and hence does not significantly affect midmission results. Develop a preliminary contamination model to fit Abell 1795 data at the centers of both ACIS-I and ACIS-S arrays as a function of time. Add a spatial component appropriate for each array. Fit the raster scans of Abell 1795 observations using a purely elemental model, adopting edge constraints measured from the gratings data, and determine the normalization of the contamination model as a function of position and time. Fig. 8: The C-K optical depth determined from fits of blazar gratings data using a preliminary contamination model (designated 9951) for ACIS-S. 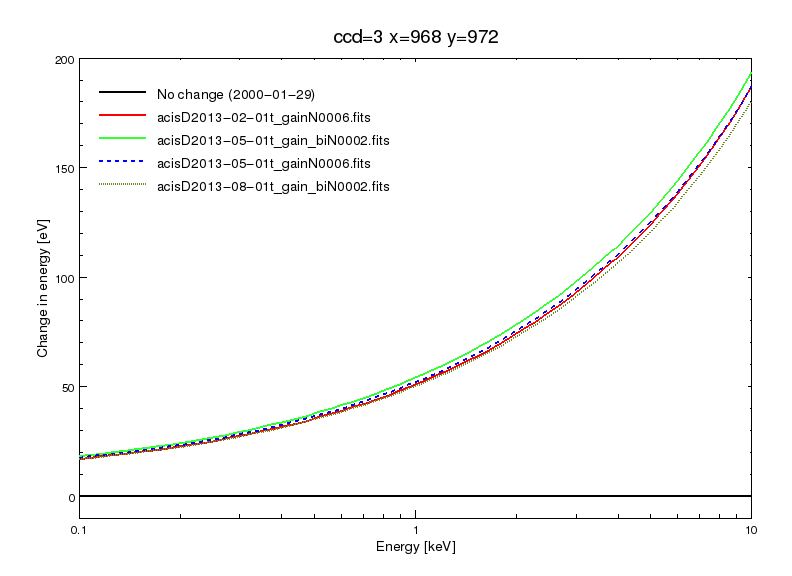 Hence, ACIS CONTAM version N0008 accomplishes two goals, (1) implementation of a more realistic model (without the edgeless "fluffium" component used in previous models) and (2) more accurate representation and prediction of current and future loss of effective ACIS QE due to the OBF contamination layer. Caveat to users: Beware when using high ChipY locations on ACIS-S3 for imaging spectroscopy with the CONTAM N0008 model! We are somewhat uncertain of the contaminant layer depth at high chipy for ACIS-S, and fitting results may be compromised at this location. The overall affect of the increasing contamination layer is best illustrated using spectra from Abell 1795, a stable source observed by the ACIS Calibration team annually since the start of the mission. See Fig. 10, for an illustration of the loss of effective ACIS-S effective area with time. These data have been used for the first step in modeling the contaminant layer with time. Fig. 10: This figure shows the result of a simultaneous fit to spectra extracted from nine observations of A1759 in 2000, 2002, 2004, 2005, 2009, 2010, 2011,2012 and 2013.
using CONTAM N0007; the dashed curves give the same, but using CONTAM N0008. However, the more rapidly increasing contamination layer does indicate that ACIS-S is not optimal for very soft sources in the future, particularly at and below the Carbon edge (283 eV). It is suggested that LETG/HRC-S is a better configuration in this energy range going forward, with larger EAs and better calibrations as well. A new HRC-I GMAP has been generated for the (UTC) period 2013-09-16T12:00 to the present, and extending into 2014. The corrections were generated using G21.5-0.9 and HZ 43 calibration observations taken regularly to monitor HRC-I, combined with a sequence of ArLac observations at 21 specific locations on HRC-I, taken annually. The HRC-I gain continues to decline slowly (typically ≤5% per year). Annual updates to the gain maps are found to be adequate to maintain 2% consistency in the PI. Images of the new Sept 2013 GMAP, and a ratio of the new map to the previous (2012) one already in CalDB are shown in Fig. 13A & B below. In Fig. 13B, the sense of the ratio is that the 2013 map includes equal to or larger corrections (equal to or greater than unity) compared with last year's gmap. and periodic HZ43 and G21.5-0.9 observations. Fig. 13B: Ratio of the new 2013 GMAP to the one from 2012. A corresponding upgrade to the PIBGSPEC library fo 2013 has also been derived, effective for the same time-period as the above HRC-I GMAP. The background PI spectra are generated from the same HRC-I calibration observations of AR Lac used to derive the new GMAP. These 21 observations are reprocessed with the new GMAP, generating new PI scaled to SUMAMPS values. For each year, the HRC-I Cal team extracts events in a 800x800 pixel box at the 17 observation locations that are within 10 arcmin of the aim point, excluding the location of the source. They sum the PI spectra from each location, weighting by exposure time, to create the final PI spectrum for the year. 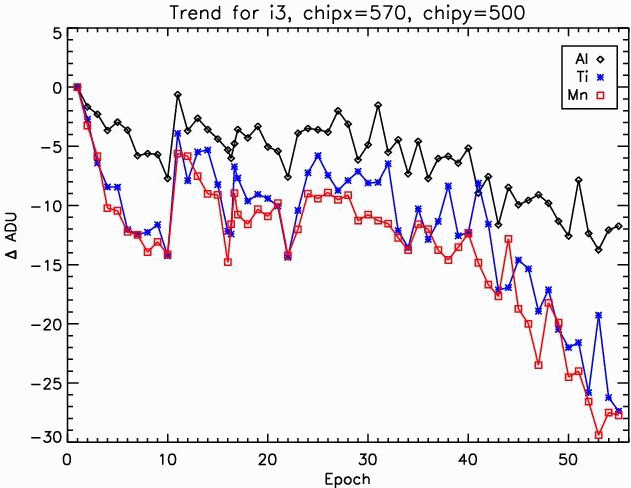 Finally, the PI spectra are Loess-smoothed with a third-degree polynomial fit over ranges 10 channels wide. Fig. 14: The HRC-I Background PI spectra for 2000-2013, including the latest spectrum derived from Sept 2013 AR Lac data.